Late last year I wrote on this blog about my frustration with the lack of Big Ideas driving innovation. My rant was stimulated by a New York Times article on the grim underbelly of the “an app for everything” culture: people who were working on “small ideas,” and losing their shirts in the process. I also shared the thoughts of other entrepreneurial leaders, investors, and journalists, also bemoaning the fact that we seem to have lost our way, and are no longer thinking BIG. This morning I stumbled on a post on the HBR Blog Network, entitled “Idea Entrepreneur: The New 21st Century Career. 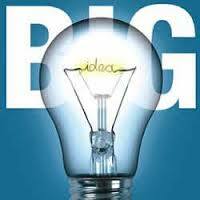 I took some editorial license and added the word “Big” simply because the author was actually making the case for Big Ideas, and the hopeful sign that there may be a re-emergence of people who care about Big Ideas. Read my original post here, followed by today’s HBR Blog post. Idea entrepreneurs are popping up everywhere. They’re people like Sheryl Sandberg (Facebook COO and author of Lean In), who is advocating a big new idea from within an organization. And like Atul Gawande (the checklist doctor), who is working to transform a professional discipline. Or like Blake Mycoskie (founder of TOMS shoes), who has created an unconventional business model. In my research into this phenomenon (which forms the basis of my book, Breaking Out), I have been amazed at how many different kinds of people aspire to be idea entrepreneurs. I have met with, interviewed, emailed or tweeted with librarians, salespeople, educators, thirteen-year-old kids, marketers, technologists, consultants, business leaders, social entrepreneurs — from countries all over the world — who have an idea, want to go public with it, and, in some cases, build a sustainable enterprise around it. They play many roles. They are manager, teacher, motivator, entertainer, coach, thought leader, and guru all rolled into one. Think Reid Hoffman (founder of LinkedIn and author of The Start-Up of You), Daniel Pink (author of Drive) or, in India, Kiran Bedi, leader of a worldwide movement to transform prisons and root out corruption. They create a platform of expressions and generate revenue to support their social activities. Idea entrepreneurs have to be exceptionally good at expressing their idea, and usually do so in many forms. They give private talks and major speeches, write books and blogs and articles, participate in panels and events, engage in social media — activities that can generate revenue (sometimes in considerable amounts), through a combination of fees, sales of their expressions, and related merchandise. Jim Collins has created a long-lasting enterprise supported by the sale of books and media, as well as fees for consulting, speaking engagements, and workshops. They offer a practical way to understand and implement their idea. Because people have a hard time responding to an abstract idea, the idea entrepreneur develops practices (and personally models them, too) that lead people to the idea through action. Bryant Terry, an “eco-chef” who argues that good nutrition is the best path to social justice, embeds his ideas in cooking methods and suggestions for social interaction around good food. They draw other people into their idea. The idea entrepreneur gathers people into the development, expression, and application of their idea. They form affiliations, build networks, and form groups. Al Gore created the Climate Reality Project Leadership Corps to bring his ideas about environmental sustainability to people around the world. Eckhart Tolle, a spiritual leader and author of The Power of Now, has established the online Eckhart Teachings Community with members in 130 countries. This inclusion of many people in many ways creates a phenomenon I call respiration— it’s as if the idea starts to breathe, and takes on a life of its own. They drive the quest for change. It is all too common that people with an idea for an improvement or a change to the world are satisfied to point out a problem, propose a solution, and then expect others to execute. The idea entrepreneur, however, sees the expression of the idea as the beginning of the effort — and it can be a lifelong one — in which they will continue to build the idea, reach new audiences, and offer practices that lead to change. Dr. Bindeshwar Pathak, based in Delhi, believes that world-class sanitation is necessary for India to realize its full potential. In forty years of idea entrepreneurship — spent in writing, speaking, travelling, network building, and technology development — he has influenced the way millions of people think and act. People who have shaped our thinking and our society over the decades, even centuries, and continue to do so today — from Benjamin Franklin to Mohandas Gandhi to Hannah Salwen, an American teenager who modeled a disruptive approach to philanthropy — have followed the path of the idea entrepreneur. These days, the model is well-defined and, thanks to the amazing range of activities we have for creating and sharing ideas, is within reach for just about anyone. If you have an idea, and want to go public with it, idea entrepreneurship can be one of the most powerful forces for change and improvement in the world today. Great thoughts! The key here is their total immersion in their idea; it becomes their passion throughout their life and they inspire others through that passion. The word ‘respiration’ sums it up; the idea takes on a life of its own.